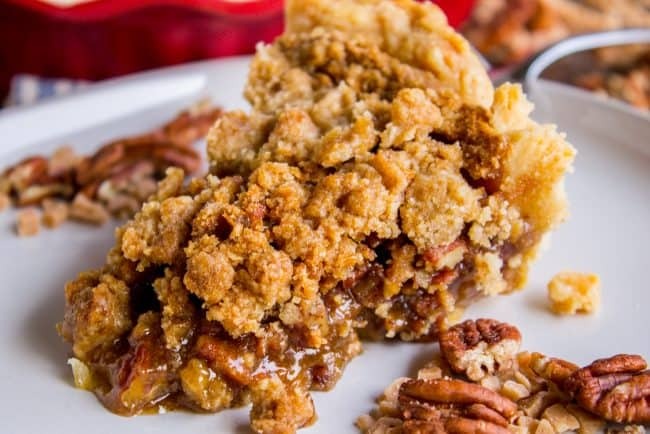 This is not your average Pecan Pie recipe! 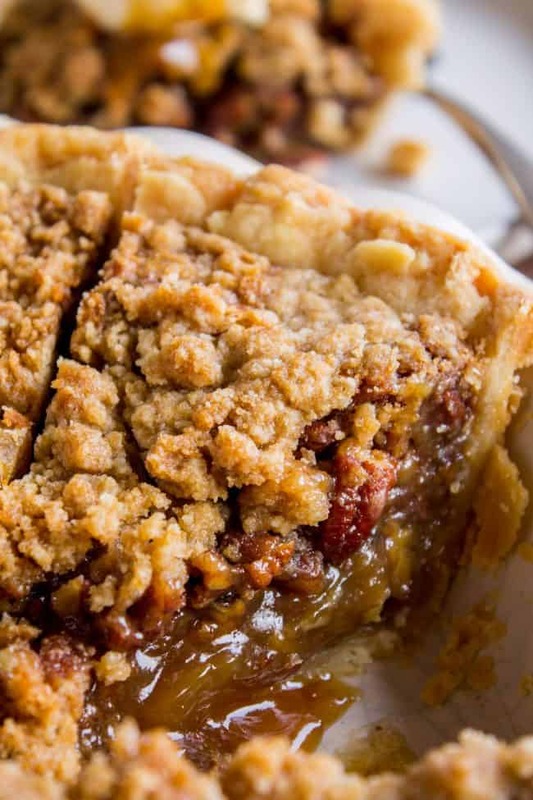 First we brown the butter, then we adds toffee bits (which melt into a glorious caramel filling), and THEN we top it off with a supremely buttery streusel that I promise is not too sweet, but instead adds the perfect crunch. You are going to WIN Thanksgiving this year my friends. The other night Eric and I settled in for our Netflix and chill. For us that means new episodes of The Good Place or reruns of The Office (because it just never gets old). And also whatever treat I’ve been working on lately for the blog. I was snuggled in with a blanket and Eric asked, do you want a slice of pecan pie? (I’ve been testing this recipe all week) I said yes please! so he brought me a slice of pecan pie. Just the regular kind. No streusel. The first pecan pie recipe I tested. I said, um, what is this. He said, pecan pie. I said, there is no streusel on this pie. Eric, once you streusel, there is no going back! Streusel fulfills two purposes in my mind: it adds sugar and it adds CRUNCH. It’s perfect for a not-too-sweet muffin. But Pecan Pie is already SO sweet, so we are adding a minimal amount of sugar to our streusel, just 1/4 cup. It’s actually mostly flour and butter. It crisps up into a beautiful, gorgeous crumb topping that will make your Pecan Pie recipe the star of the show. 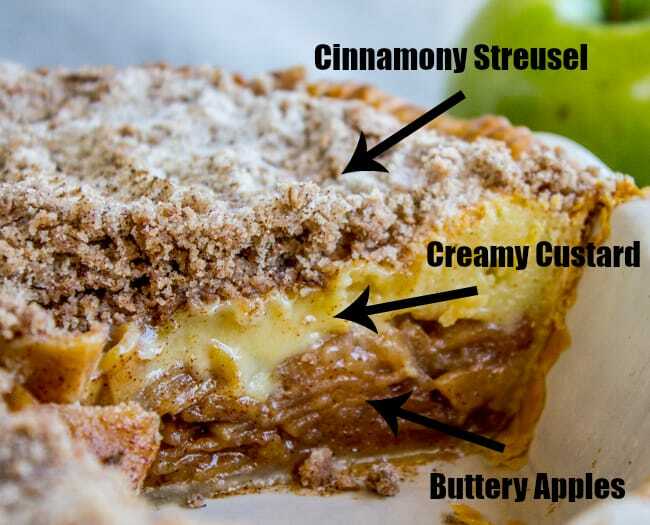 Seriously, once you streusel, you will never go back. (Kind of like how I’m never going back to regular pumpkin pie after torching the top of it like a crème brulée. Here’s a pie crust refresher. 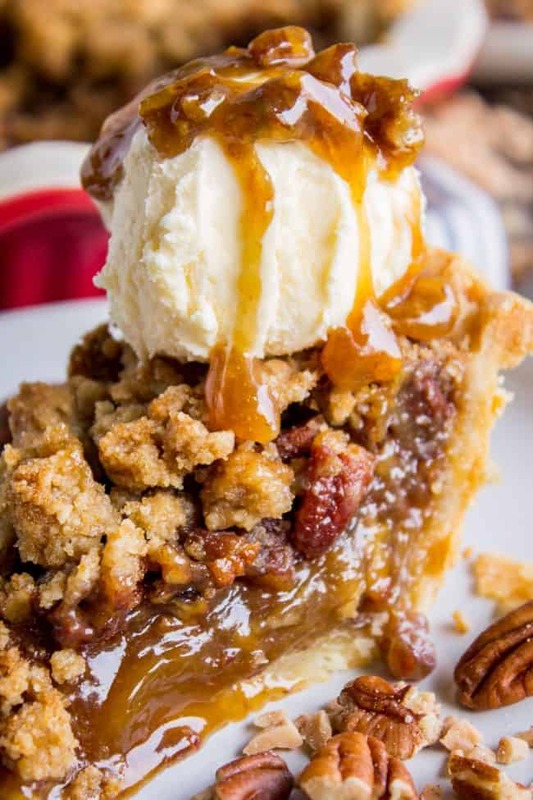 Before I thought of adding streusel on top, my goal was to make the best pecan pie recipe ever. So I did a bunch of research and compared tons of recipes. Here’s what I came up with for the most flavorful, perfectly textured pecan pie recipe: a combination of sugar and corn syrup to get that caramel-y filling, browning the butter to add even MORE buttery flavor, a touch of lemon juice to balance all the sweetness, a bit of flour to thicken the filling a bit, and finally: TOFFEE BITS. When I tested this pecan pie recipe the first time, I thought the toffee bits would stay hard, and each slice of pie would have little crunchy bits in it. (Who can say no to crunchy toffee bits?) But that’s not what happened. 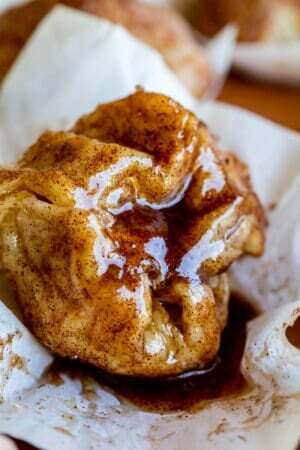 They melted into the brown sugar filling, giving it an even deeper caramel-toffee flavor. YASSSS. 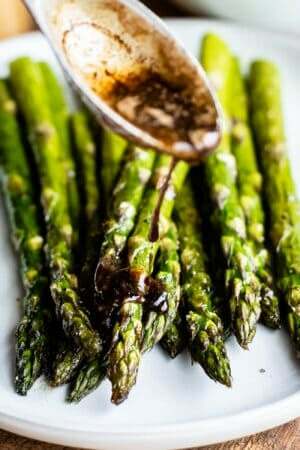 And if you don’t know about the secret of browned butter, let me share with you. BROWNED. BUTTER. WILL. CHANGE. YOUR. LIFE. It adds SO much flavor. 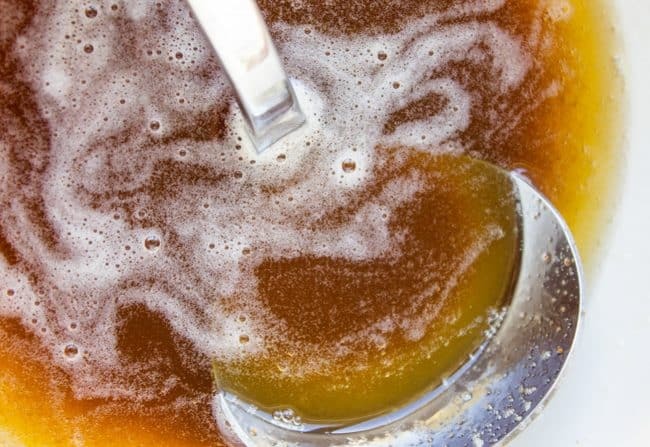 You can take any average recipe and brown the butter and make it into an AMAZING recipe. Here’s how to make a homemade pie crust shield. Your crust WILL burn if you don’t cover it for the last half of the bake time. Does pecan pie need to be refrigerated? Nope! You can leave it on the counter. I would throw it in the fridge if it’s not gone by day 3. But I’m not sure who could have this pie sitting on their counter staring them in the face and it not be gone within 3 days. I know I don’t have that kind of will power! Pecan pie is of course the perfect dessert for Thanksgiving, not only because it’s traditional, but because it’s best made 1 day ahead. 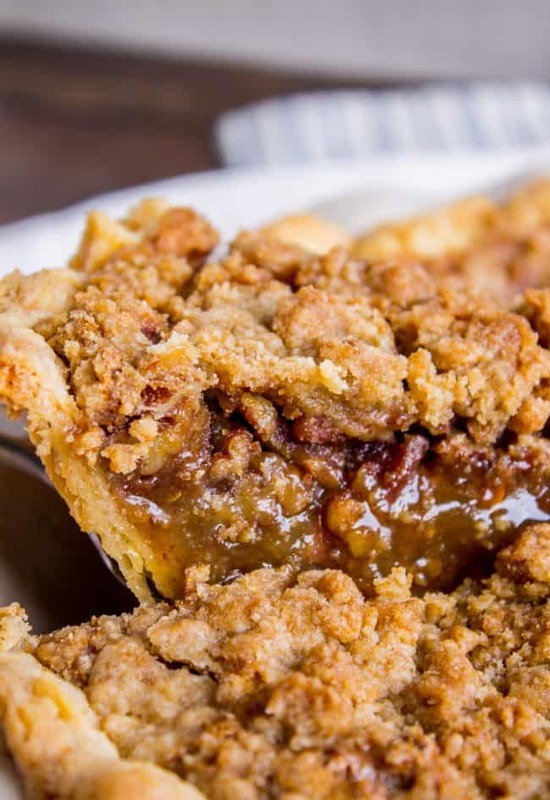 The flavors have time to marry, and the pie has a chance to cool off 100% (seriously, you will have a mess if you cut into a hot pecan pie). Plus it’s super easy. What else are you guys making for Thanksgiving this year?? I’ve got an easy cranberry sauce coming your way soon, plus the perfect appetizer you never knew you needed. Check out the Homemade Green Bean Casserole I just posted (soo good), and the Cornbread Stuffing with Bacon and Sage, which is the only stuffing I will make from now on, or variations from it. Cornbread ftw. One year ago: What You Should Make For Thanksgiving! Fill a small bowl with ice and water so it is ready when you need it. Use a pastry cutter or fork to cut in the butter and Crisco. I find it's easier to chop the butter up a bit with a knife before adding it in. Cut with the pastry cutter until it looks like coarse crumbs. Don't overdo it! You want pea-size chunks of butter. See photo. In a small bowl beat one egg. Pour out half (into the sink or into another container, or heck, into a frying pan). You can just eyeball it. Add 1/4 cup ice water to the half beaten egg. Beat it together with a fork, then add it to the flour mixture. Stir until it is just coming together, then use floured hands to knead it once or twice (only to make it come together). Divide the dough in half. Arrange the pie crust and fold any excess crust underneath (I don't believe in trimming it off. Just fold it under!) Crimp as desired. Place the pie pan in the freezer or fridge while you make the filling. Preheat the oven to 400 degrees F. Place a baking sheet in the oven on a center rack. In a large bowl or stand mixer, use the whisk attachment to beat 3 eggs for 2 minutes. Add 1/4 cup sugar, 1 cup brown sugar, and 1/2 cup corn syrup. Beat for 1 more minute, scraping the sides and bottom of the bowl. Add the slightly cooled butter and beat well. 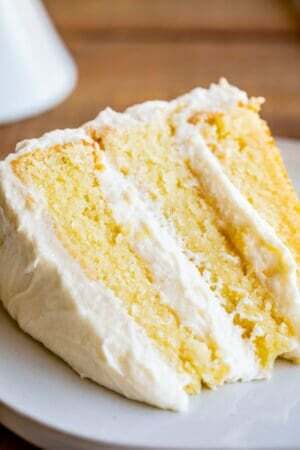 Add the milk, vanilla, salt, lemon juice, and flour. Beat well, scraping the sides and bottom. Fold in the toffee bits and chopped pecans. You can take a moment to toast your pecans before adding them in, it's never a bad idea! Pour the filling into the chilled pie crust. Place the pie on the hot baking sheet in the oven. 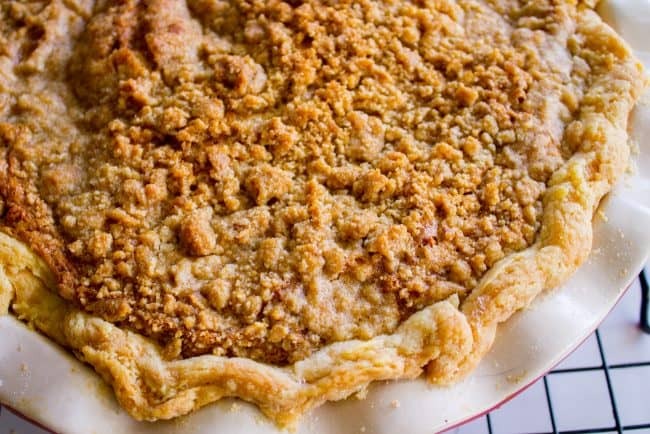 Once the pie is in the oven, immediately turn the oven temperature down to 350 degrees F.
Meanwhile, make the streusel topping. In a medium bowl, whisk together 1/2 cup flour and 1/4 cup brown sugar. Use a pastry cutter to cut in 1/4 cup cold butter. Do you best to cut it into a mixture that looks like coarse sand with some larger butter chunks. There is a lot of flour in this streusel, so eventually I used my hand to squeeze it together and make chunks. Put the streusel in the fridge or freezer until you need it. Fold a pie-size square of aluminum foil in half, then in half again. Use scissors to cut a circle out of the center. When you open the aluminum foil, you should have a square piece of foil with a circle cut out of the middle. See photos. This will be your crust shield. After the pie has baked 30 minutes, carefully remove it from the oven (it will be quite wobbly). 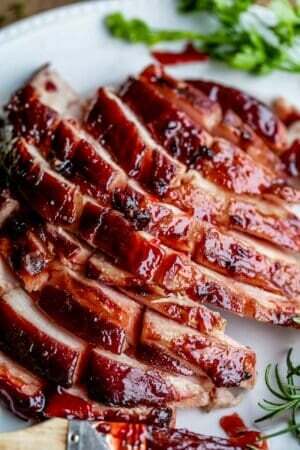 The top should be lightly browned. Add the streusel all over the top of the pie. Carefully place your foil pie shield over the crust of the pie and fold around the edges. Put the pie (on the baking sheet still) back in the oven. Continue baking for another 30-37 minutes. Total time in the oven for my pie was 67 minutes. This is going to vary depending on every oven! The pie will still be quite wobbly in the middle, but the edges should only jiggle a little bit. Serve with vanilla ice cream! The caramel-y topping on the ice cream that you see in some of the photos is the filling from the pie spooned on top. More pies to make for Thanksgiving! 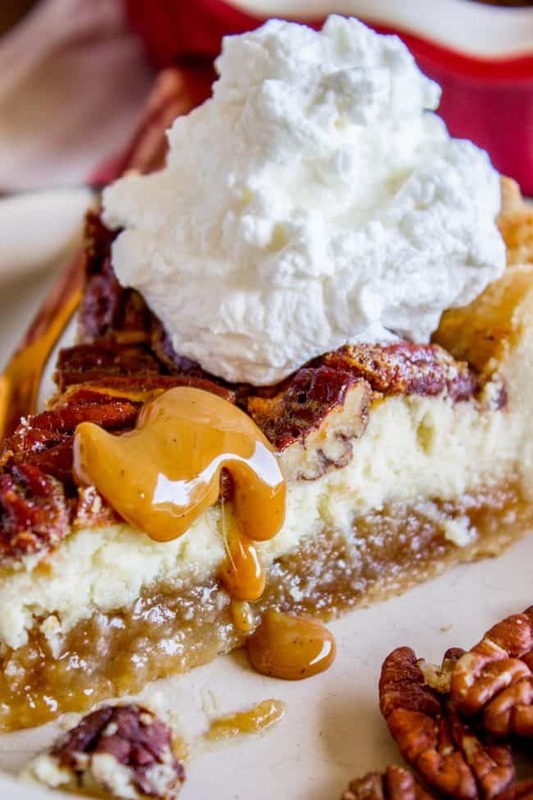 Cheesecake Pecan Pie << this is the only other Pecan Pie I will make besides today’s recipe. Because CHEESECAKE, hello. 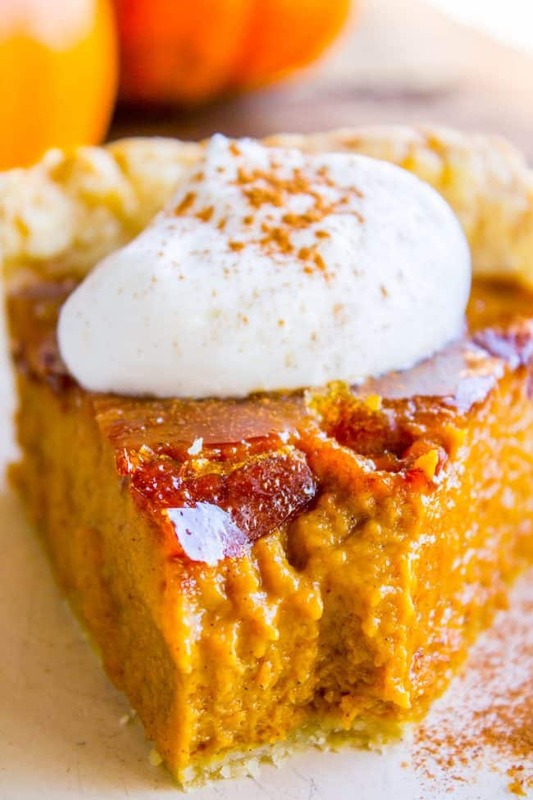 Crème Brulée Pumpkin Pie << here’s another classic pie that we are taking up a notch! More Thanksgiving pie ideas from friends! Cranberry Gingersnap Pie from View From Great Island << YUM. 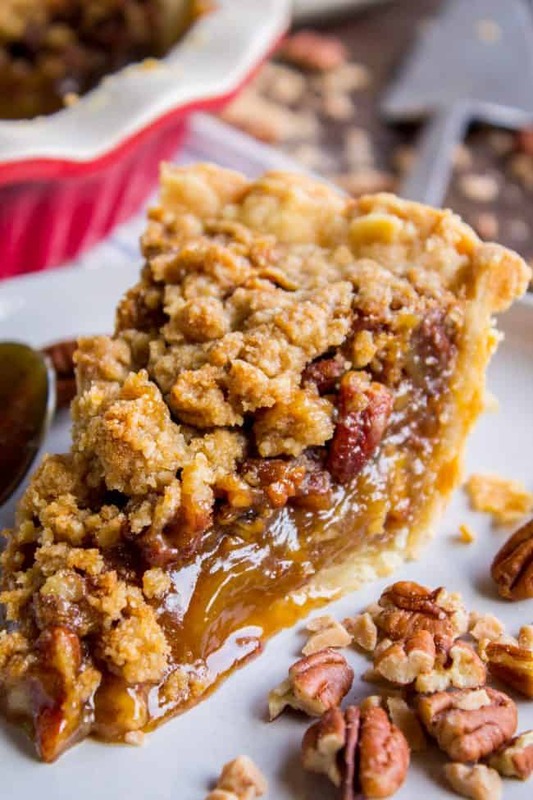 OMG, you are so right, this is the most incredible pecan pie!! While I did overcook it a bit, it was marvelous. Smooth, rich, and a wonderful caramel flavor. If you want to impress…this is the pie to serve. Hooray! I’m so glad it was a hit Linda! It’s really hard to be a good Pecan Pie :) Thanks so much for reviewing! 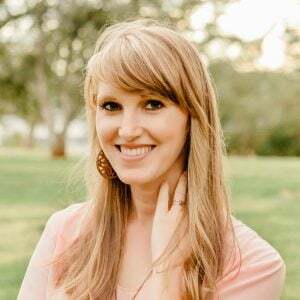 Hey Jennifer! I actually made this in a deep pie dish and it worked out great. I think it would work in either. enjoy the pie!! I made your pecan pie for a pie contest at work and won!!! It was the first time I’ve ever made a crust from scratch. I made two so I could have one for home also. Everyone just loved it! Thank you for sharing. That is so awesome Karin! I’m so happy to hear you won, and that you were smart enough to make two so that you could eat one at home :) I’ll be making two of these pies tomorrow too! Happy Thanksgiving! Karen, this looks amazing! I’m going to make one small all change, though. My moms recipe uses dark corn syrup, which I love and has a delicious caramelly flavor which I believe adds more depth. I love the browned butter and the topping. 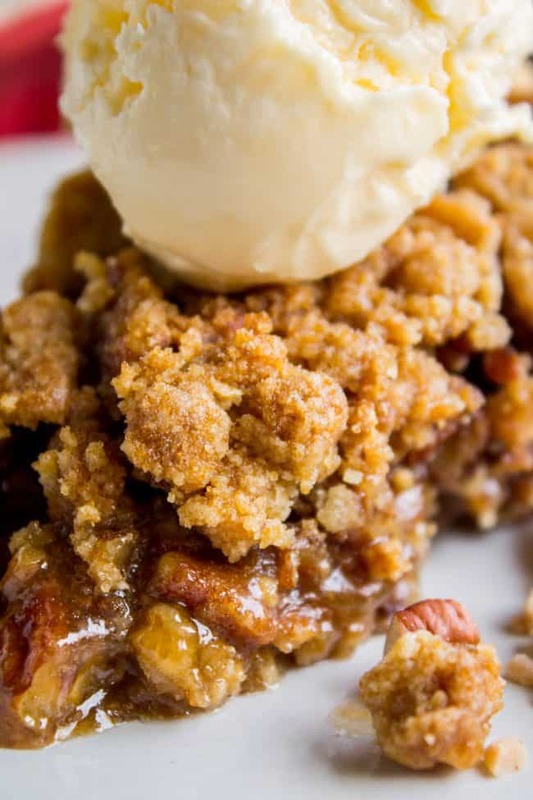 This is a definite improvement over regular pecan pie! This looks fabulous, I’m definitely a crusty, strudel type of pie eater . Filling has always been secondary for me. Right? Strudel and crusties forever! Always the best part of a pie. I hope you get to make this soon! Thanks Wendy!